On Friday the 20th of January 2017, we had our annual SANEC - NABC Africa New Years Reception. 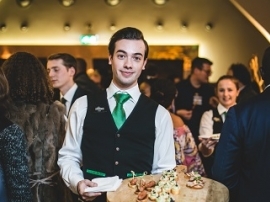 The reception was hosted by SANEC boardmember Heineken International at the Heineken Experience in Amsterdam. We would like to give a special thanks to Heineken International for making our annual Africa New Years Reception a success again. We would also like to thank the +200 participants for coming to our event and toasting to a fruitful new year with us. The event shared two insightful presentations by Mr. Paul Hol on sustainable business in Africa and Mr. Patrick Gaincko on African Consumer trends 2017. We would like to give a special thanks to them for sharing their insightful information with us. For a photographic impression of the event, please have a look on our Facebook page here and do not forget to give us a like.